We're excited to share some insight into the thought processes of our composers and visual artists with our new blog. We'll continue to share ideas, sounds, and images from our most recent show, performed August 31st at the Theatre at The Ace Hotel. Next up, we have Jeremy Zuckerman. Since the first Echo Society concert, I’ve been experimenting with composing musical systems inspired by natural systems. I've been motivated to create pieces which are not only interesting from an analytical perspective, but also exciting and moving, foreign yet familiar--something to help us access our humanness. It’s been a complete change of perspective to switch from the traditional microscopic note-by-note way of composing to creating from a macroscopic view where each event (e.g. note) serves the whole but isn’t particularly musical on its own. For our most recent show V (check out Nathan Johnson's beautiful post for an explanation of the overarching theme for the show), I decided to write a piece for a cappella mixed choir dispersed in surround. The text source for my piece (titled Polymer) is Yeats' The Song of Wandering Aengus. For those unfamiliar with the poem, it's a story of a man who experiences a brief, magical event in his youth, an event in which he spends the rest of his life wandering in search of. There is a beautiful sense of longing in the poem, as well as a duality which represents the dream/fantasy world ("the silver apples of the moon") versus the physical world ("the golden apples of the sun"). I started with composing eight diatonic lines of pitches (one line per two voices) which begin with a narrow range and gradually widen (sopranos move up, basses move down). Using the audio programming language SuperCollider, I used these lines as source material to compose 16 independent random walks for each voice of the choir. 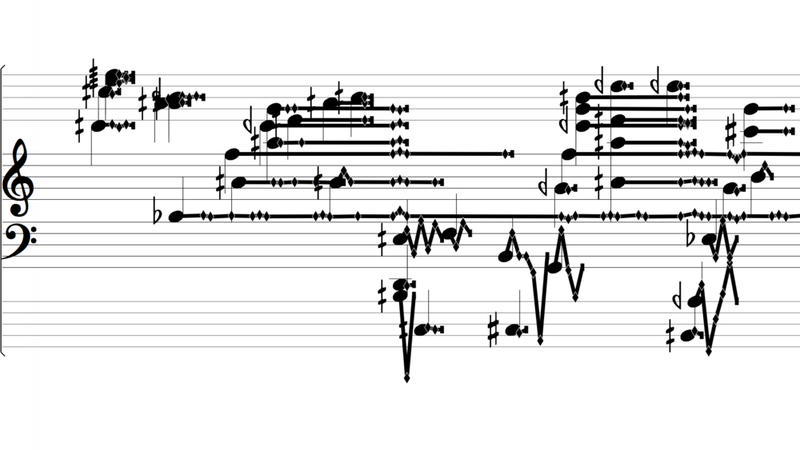 The overall note duration shape is similar; the individual durations begin long and slowly shorten, then elongate again. The x-axis is the timeline and the y-axis is general pitch range. The text begins with meaningless syllables. After a bit, a system of text derived from a line from the poem is introduced. The lyric streams divide into four, then eight and finally 16 as the pitch ranges reach their widest and the durations reach their shortest. (Each new text stream uses a different line from the poem.) Gradually, the streams converge (eight, four, two) and finally return back to the syllables. As the text converges, the pitch range narrows and the durations elongate. To spice up the texture and to add another layer of transformation and because the human voice sounds so freaking beautiful the way it articulates phonemes, I introduced into the system several different rhythmic figures whose occurrences were determined by weighted randomness (i.e. the chance or likelihood of something happening). Because I wanted Polymer to begin very placidly, gradually increase in complexity and then return to placidity, there was no chance of a rhythmic figure at the beginning. As the piece progresses, the chance of the rhythmic figures occurring increases. At Polymer’s peak, the number of rhythmic figure occurrences are highest. Gradually, the chance of occurrences decreases till it reaches a chance of zero (no rhythmic figures). A polymer is a molecule made up of repeating components. ‘Polymer’ means many parts. Polymers are represented with random walk models. Polystyrene is a polymer. So is DNA. We're excited to share some insights into the thought processes of our composers and visual artists with our new blog. We'll be sharing ideas, sounds, and images as we lead up to our show on August 31st at the Theatre at The Ace Hotel. Next up, we have Nathan Johnson. I love musical interludes … those little moments that give us space to breathe, while somehow tying broader themes together. In theatrical productions, these entr’actes (literally, “between the acts”) were originally short pieces of music or dialogue used to distract audiences from set changes happening behind closed curtains. The interludes would serve as bridges between the main events of a story by expanding on motifs, creating tonal shifts, and sometimes even developing self-contained plots of their own. I’m always intrigued by art forms that emerge from technical restrictions, and history is rich with examples. The average length of recorded music was defined and restricted by the medium that held it; likewise, the vision of a film by the aspect ratio of its frame. In the world of comics, many newspaper editors made a practice of removing the top row of panels from nationally syndicated strips as a response to space restrictions. This forced cartoonists to empty their headers of everything except a title since they knew it would be omitted for many of their readers, but Calvin & Hobbes cartoonist Bill Watterson used the extra space to draw self-contained preludes. These served to introduce the theme of the story, and, in many cases, they were as enjoyable as the entire comic. This is the nature of how forms develop. In the case of the interlude, a technical restriction gave birth to an artistic solution that continued on, even as the original restriction ceased to exist. There’s absolutely no technical reason for an interlude in a movie, but we still occasionally see them used to great artistic effect. I’d be hard-pressed to find a scene in a recent film that made me smile as much as the boisterous accordion entr'acte from Leos Carax’s Holy Motors. Likewise, I was astonished and thrilled by the left turn P.T. Anderson takes in Magnolia where, for a brief moment, the camera finds the main characters spread across Los Angeles and inexplicably singing the same song. The music isn’t diegetic, and Anderson makes sure you’re not confused about this, as the song never feels like it’s coming from a record player or a car stereo in the scene. It’s just there, maybe in the atmosphere. The characters simply sing along with the disembodied voice of Aimee Mann, and the scene is unexpectedly magical and heartbreaking. With the Echo Society shows, we’ve never had a technical reason to consider interludes since we’re not changing scenes, but as I began thinking about our upcoming show, I started getting excited about writing a handful of smaller “linking pieces” that could weave through the entire night. Our shows are, by nature, fairly modular. In the past, we’ve begun our preparation by choosing a common theme (“Bloom” or “Veils,” for instance), but we’ve been pretty isolated in our writing, sometimes not hearing the other compositions until the first rehearsal. This show will be different for a number of reasons, but one key shift is that we’re focusing more on the night as a whole. Usually, our musical director, Joe, waits to sequence the show until all the pieces are complete, but this time we wanted to take a different approach. So, three months ago, we gathered around Rob’s dining room table and started sketching out the arc of the whole evening before a single note was written. We plotted out dynamic levels, transitions, and instrumentation changes, and then met up repeatedly over the following months to share our progress. We’re now thinking further outside of our own compositions and digging for ways to create a more unified experience that represents the title of our fifth show: V.
Breath is, of course, the thing that sustains us, but it also empowers a unique voice, both literally and metaphorically. This is one of the things that has been so inspiring about working with the composers in the Echo Society. Each show reminds me of the variety of voices being expressed, from Jud’s cinematic melodicism to Jeremy’s electronically-generated pattern work. Preparing for this show has been especially fun for me, because I’ve had the opportunity to peek into what makes each of the other compositions tick, and then think about ways to bridge the gaps between them. In some cases, this involves playing around with keys and timing, often calling the other composers to float ideas about how I might interpret pieces from their work. If you look at my writing session, it’s actually laid out sequentially like a film, with the other compositions abutting and overlapping my files for context. In the photo above, you can see individual pink snippets from Brendan's piece that that he sent over for me to incorporate into one of my compositions. In this way, I’m quoting, referencing, and repurposing other elements in order to tie these voices together. And this brings me back to our overarching theme for the night. In writing interludes, I’m operating in the spaces between the acts, looking for a common thread to connect the dots. I decided early in my process to feature an actual voice, so I’ve been working with my frequent collaborator (and one of my personal favorite voices), Katie Chastain. Each interlude has developed into a sort of meditation on breath, and I’m reminded that although air is, essentially, unlimited, our breaths are not. I almost imagine the voice in these interludes as a spirit of the theater; a spectral observer from a forgotten time, reminding us that we have the opportunity to use our breaths – our lives – to create something unique. We're excited to share some insights into the thought processes of our composers and visual artists with our new blog. We'll be sharing ideas, sounds, and images as we lead up to our show on August 31st at the Theatre at The Ace Hotel. Next up, we have Eskmo. One of our goals since the beginning of starting The Echo Society was to host these events in locations that were unexpected, distinct in their own right, and flexible enough to allow us to make new creative choices at each step along the way. Our process of transforming each location has multiple stages, and way too many contributions from a large team, to describe in full detail, but I'd love to give a birds eye view the motivations for us as a collective. We set out to find locations in LA that inspire us from the moment we see them, and these spaces have so far included a sound stage built in 1916, a downtown church, and an unused warehouse in the Arts District. For our fifth show, "V," we are thrilled to have it take place in a beautiful space built in the 1920s, The Theatre at Ace Hotel. For every show, each composer is required to compose a brand new piece of music written specifically for the orchestration put together for that particular night. And for each show, the ensemble changes. This in itself is a huge undertaking but also a super rewarding process. The same goes for working with the spaces. Changing venues each time, which is in itself is a large undertaking, also influences the theme for the night, the lighting design, the type of orchestra we put together and drastically effects the pieces written for the particular ensemble for that particular show. This pushes the whole team, whether composers, lighting and design, sound or production, to reach further, potentially improving and trying something new and a bit risky and vulnerable. Just as a Springtime show in a church calls for pastel rooftops and floral sonic patterns, or as a winter performance in an abandoned warehouse calls for stark dynamic ice, for this next show we plan on telling a story of Spirit being injected into Matter. For this next show, just like previous ones, we are going to do some things we have never done before. We hope to continue to engage the LA community in new and creative ways step by step. With big hearts, thank you for joining us. We're excited to share some insights into the thought processes of our composers and visual artists with our new blog. We'll be sharing ideas, sounds, and images as we lead up to our show on August 31st at the Theatre at The Ace Hotel. This week we start with Deru. The name for this show is "V", or five, and while doing some research we came across the idea that in numerology, 5 represents the "symbol of the incarnated conscience: 4, Matter, + 1, Spirit", and as a way to unify the show we've begun thinking about our creative theme as being: "Spirit Into Matter". The hopes with my piece, therefore, is that I can extract the 'life' out of the acoustic instruments on stage by analyzing them and playing with their pitch data in interesting ways. I'm also continuing my exploration into partials and microtonality that started while writing my piece for our last show, "Veils". Complex sounds, like acoustic instruments, have a series of sine waves at various frequencies and amplitudes that combine to form the original sound. So a partial is any of these individual simple sine waves that compose a complex sound. Because acoustic instruments aren't electronically generated you end up with partials at frequencies that don't fit into western scales, so you end up with microtonality. This form of microtonality has opened up a huge world of colors for me, and they are colors that I love. The sounds evoke feelings that don't seem to exist in our normal 12-tone scales. They are 'other' and 'dark' but they also make sense and have a system to them. Brakedrums made from spare car parts. My piece will be based on percussion, so I've been analyzing the partials of the various instruments that will be on played stage, with the aim of being able to blur the lines between the instruments played acoustically and the electronics coming out of the speakers. I've also been playing with the beat frequencies that occur when pitch shifting two partials against each other, as a source of rhythm onto itself. I hesitate to give too much away in terms of sound, but below are two quick examples. The first one is a brake drum (see photo above) being struck and some sine waves, playing back the exact frequencies of the partials in the recording, taking over. The second is a bowed cymbal with sine waves extending and playing with the partials over time. I'd like to leave this post about technique over content for the time being, as I have quite a few surprises that I'd like to leave as surprises, but this space will update regularly as our composers and collaborators share their processes and thoughts. Partial amplitudes in a sequencer.